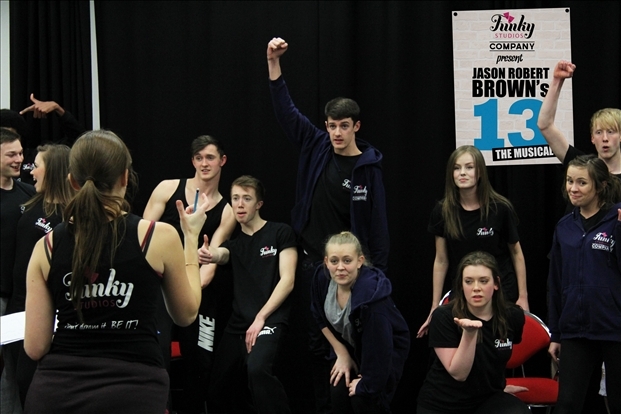 Mansfield-based performing arts company – Funky Studios Company – is bringing a New York musical to Create Theatre this March. Jason Robert Brown’s ‘13’ brings the book by Dan Elish and Robert Horn to life, telling the story of Evan Goldman, a young man who is uprooted from his life in New York City to a rural Indiana Town. While grappling with his parents’ divorce, preparing for his Bar Mitzvah and trying to deal with the complicated social circles of a new school the story tells of Evan’s coming of age as he approaches being 13. The performance, featuring a six-piece band and presented by arrangement with Josef Weinberger Ltd on behalf of Music Theatre International of New York, comes to Create Theatre on Thursday 6, Friday 7 at 7.30pm with a matinee showing on Saturday at 2pm. Saturday evening’s performance has already sold out. Principal of Funky Studios and director of 13, Katie Funk, said: “This is a very high-energy and exciting musical and we’re delighted to be bringing this to Create Theatre. “I think this will appeal to young and old alike as we recall what it’s like to be entering adulthood like the main character Evan. Come and see what amazingly talented young performers we have here in Mansfield!" Tickets cost £10 per person with concessions at £6 and can be purchased by visiting www.createtheatre.co.uk or by calling 01623 413363. The show is suitable for people aged 12 upwards.